Well, at least that's the conclusion I make from looking at the sepa.gov official website here which monitors (certain) pollutant levels. Last Sunday a new scheme for car reduction was introduced pre-games which allows cars to go on the roads only on odd or even days, depending on the number plates. 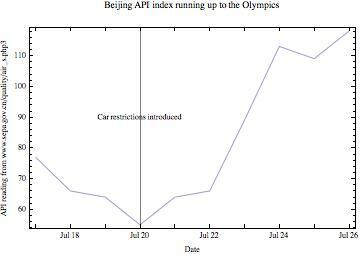 Since then, although the traffic has noticeably decreased, the pollution levels have been steadily rising. I created the following from the data on the above linked site (apologies for the mistake in the figure, API index should simply say API).